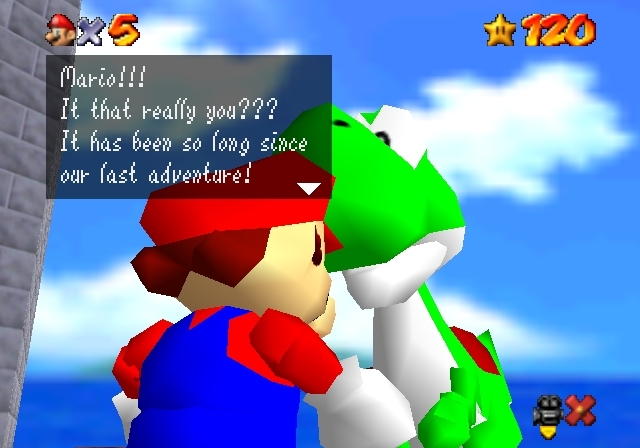 One of the biggest typos of 1996 can be found in Super Mario 64. Yoshi is hanging out on the roof of Princess Peach's castle, the top of the roof can be reached by using a cannon outside near the water. This cannon opens up when all 120 Power Stars are collected. You don't need to move the cannon, just fire away! 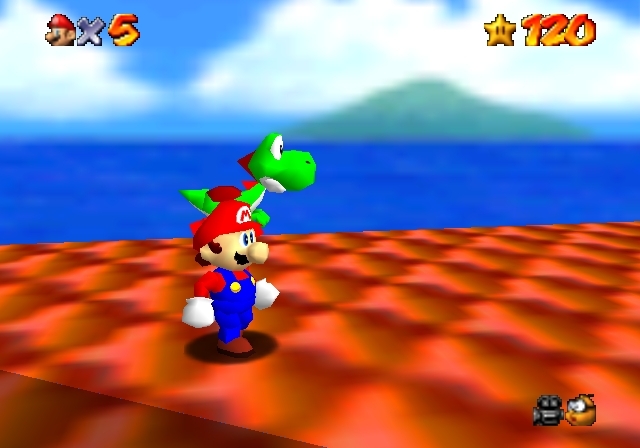 When on the roof, you will see Yoshi roaming around mindlessly walking in circles, even if you are in the way, he won't greet you until you talk to him. It has been so long since our last adventure! They told me that I might see you if I wanted here, but I'd just about given up hope! Is it true? Have you really beaten Bowser? And restored the Stars to the castle? And saved the Princess? I knew you could do it! Now I have a very special message for you. "Thanks for playing Super Mario 64! This is the end of the game, but not the end of the fun. We want you to keep on playing, so we have a little something for you. We hope that you like it! Enjoy!!!" It should really be: Is that really you??? - the development and testing teams must have been in a rush and overlooked this! Nintendo games are generally quite polished, but it's not unusual to find a few mistakes here and there. Nonetheless it's still cool that Yoshi ended up making a cameo appearance in the game! Yoshi gives Mario a special triple jump, and maxes him to 100 lives. Similar to many Mario games, this is a nice little easter egg or thank you for going the distance.